I had read about Cottonwood Canyon for years and had been looking forward to checking it our for ourselves. Unfortunately, the weather forecast didn't sound promising with a 30% chance of rain. When we got up, the sun was shining, and it was a beautiful day. We shot early morning light from Sunset Point and then went to the Visitor Center to check the weather forecast. It had been updated to remove any chance of rain, so we decided to make a run for it. We hustled back to the motorhome to make lunches and grab our stuff before heading off to the beautiful "town" of Cannonville. 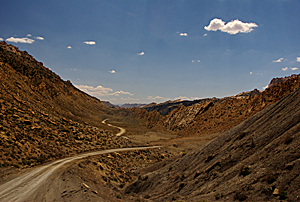 The Cottonwood Canyon road heads south out of Cannonville toward Kodachrome Basin State Park. The paving continued that far, but ended as we made the turn down Cottonwood Canyon. We endured the washboards to reach Grosvenor Arch after 10 miles. We got a pleasant surprise because the arch is huge and it was well-lit. The arch span is 90 feet, and it's 450 feet up. Standing at the base of the arch, we really got a sense of how huge this arch is. Ten miles in. Only 30 more to go. From there, it was back down Cottonwood Canyon towards Candyland. We stopped in an area we mistook for Candyland, but really enjoyed shooting it, nevertheless. 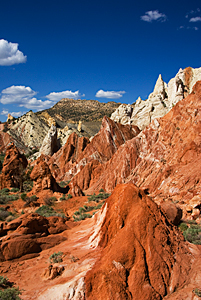 Yellow rock formations surrounded by Navajo sandstone or reddish earth made for interesting compositions. About a mile further was Candyland, a weird conglomeration of white and reddish formations that stood between two ridges in the road. We bypassed shooting them and decided to get them on the way back when the light would be better. Another five miles or so down the road was this amazing hogback with purple soil behind it. I tried to get a decent angle on shooting the hogback by climbing a small ridge. It didn't provide a good shot of the hogback at all, but it was a great perspective for Cottonwood Canyon. A stream winds down the canyon with cottonwoods just leafing out in their bright green spring leaves. Puffy, photographer clouds stepping-stoned their way across the sky. When I looked down at the rocks on the top of the ridge, I discovered they were filled with clam fossils. They were everywhere. There wasn't anything spectacular or unusual about them, but there were lots of them. The next stop was a ridge that overlooked the main section of The Cockscomb. Although it was just about noon and the light was terrible, it was still quite a sight. It took some serious uplift to move these seabed layers so they were standing on end. We continued south until we came to the Yellow Rock area. I had hoped we would be able to climb up into this formation and hike around the slickrock formations here. I had seen some amazing photos of yellow ribbons of rock, cross bedded pillow formations, and just plain weird stuff. When we read the description more carefully of how you have to climb to access these formations, we realized that was not going to happen. We did hike over to the "trail" that leads up the ridge toward Yellow Rock and checked it out. It is something we can do on another trip, but Carol was not feeling up to it after Canyon X. It's a serious climb up to the saddle and we'll have to be very careful climbing back down, but it is something we could do with a little conditioning. 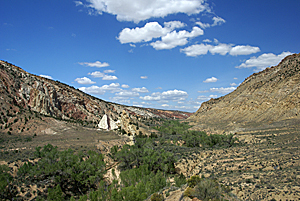 We turned around just past Yellow Rock because it appeared that we had already seen the best features of the canyon. We headed back to Candyland to shoot the formations we had passed on earlier. We were there for about 1/2 hour as we tried shooting the features from every angle. 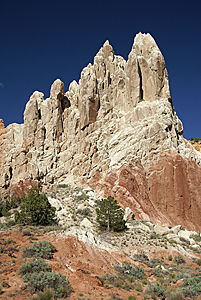 We also found the trail and parking lot for the Cottonwood Wash slot canyon that parallels the road here. We even managed to get back early enough to shoot Sunset Point in prime warm light. We shot all around the point while the formations were lit, and then set up to wait for sunset. The next hour was spent talking to the other photographers while the temperature dropped. In the end, the sunset was a dud, but we did enjoy talking to the others standing around us.